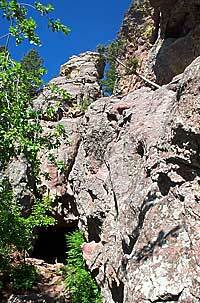 The Mallory Cave trail begins at the top of Table Mesa Drive at the National Center for Atmospheric Research (NCAR). This hike begins at the Walter Orr Roberts Trail, an interpretative trail just west of the NCAR facilities. It climbs up the eastern side of Dinosaur Mountain through the forest, up a set of stone steps between sandstone slabs to the foot of the cave. 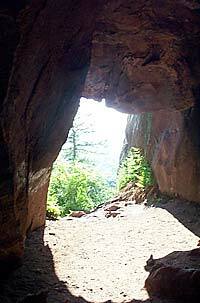 To enter the cave requires a moderate 50 foot climb up a sandstone slab. Once in the cave you have views back down east to NCAR and South Boulder.